Sometimes, you get more pleasure and feel happy to sit on the floor with your kids than sitting on the cozy sofa or reclining chair. Your family members especially, the children will be at ease to get such close presence of yours. However, it becomes difficult to sit during winter season. When the ambient temperature goes down, your feet will tremble at coming in contact with the cold floor. Instead of normal floor, you can install a concrete slab heating system. Radiant floor heating is perhaps the most comfortable option available these days to get more warmth in your living space. What is concrete slab heating? It is a responsibility of a homeowner to protect it against harsh weather and climatic conditions. During winters, when temperature drop down and becomes unbearable cold, you have to switch to a more effective and efficient heating solution to enhance your ease. Nowadays, concrete slab heating is widely in use, because it serves manifold purposes in a proper way. It is an ideal choice for garages, basements, and slab floors. With the passage of time, the application of concrete slab heating process is not limited to only residential apartments. It is also frequent in non-residential buildings or commercial structures. Proper understanding and careful planning is essential for comfortable and successful heating installation in your facility. You must keep in mind that you cannot make any changes to your heating system after the slab is fixed. A single mistake can make the process very expensive and difficult to accomplish. The floor can stay significantly warm with wrong installation. In order to make your floor comfortable for your feet, you have to consider heating your slab floor. When this is your target, your first step should be heating the slab directly and efficiently. Practically speaking, you need to heat the air space up to 6-8 foot above the slab floor. This is the best possible way to add warmth to your working or living space above your slab floor. Hence, you can sit on the floor and spend some ecstatic time with your family, irrespective of the seasons. 1. Insulation: It is strongly recommended to insulate beneath your slab. Generally, an insulation tarp is used in the process, as it offers both a reflective layer and a vapor barrier. This will ensure that maximum heat is supplied to the slab. It is the best way to supply the warmth to the intended area that is the air space above the slab floor. 2. 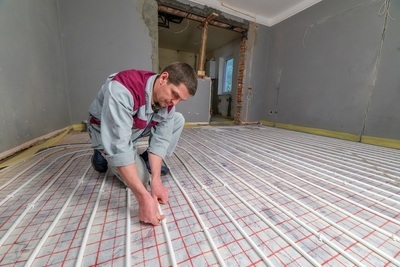 Thickness of slab: In case of a concrete slab heating system, a considerable amount of heat is transferred into the thermal mass from a hydronic unit. The time required to heat the desired area depends on the amount of the thermal mass. A thick slab takes longer time to accomplish because concrete has a particular heat absorption rate. Fortunately, the generated heat can keep the desired area warm for longer time. 3. Size of tubing: Many people want larger tubing from time to time in their slab heating application. This action is not recommended, as concrete slab has a certain absorption rate. 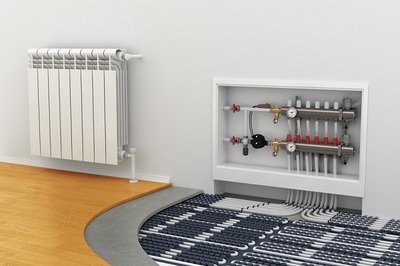 The modern heating systems are designed to maximize the performance considering the equipment involved to create and transfer the produced heat. You can make your system more efficient by changing the size of the tubing. Therefore, keeping these things in mind you can keep you home at ease with concrete slab heating system installation.